Pizza.net was supposed to be a website we could use to order pizza. This isn't 100% wrong. 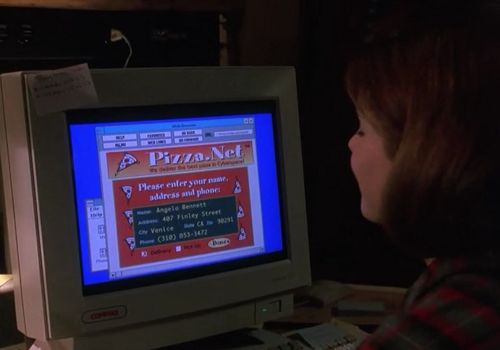 Sadly, Pizza.Net, the site that Sandra Bullock orders pizza from in The Net, is defunct, but thankfully we can order pizza and just about any other food via the Internet today. On second thought, this clip of Sandy ordering pizza, fixing herself a drink and entering a chat room by herself on a lonely evening is probably the most accurate thing about '90s Internet movies.